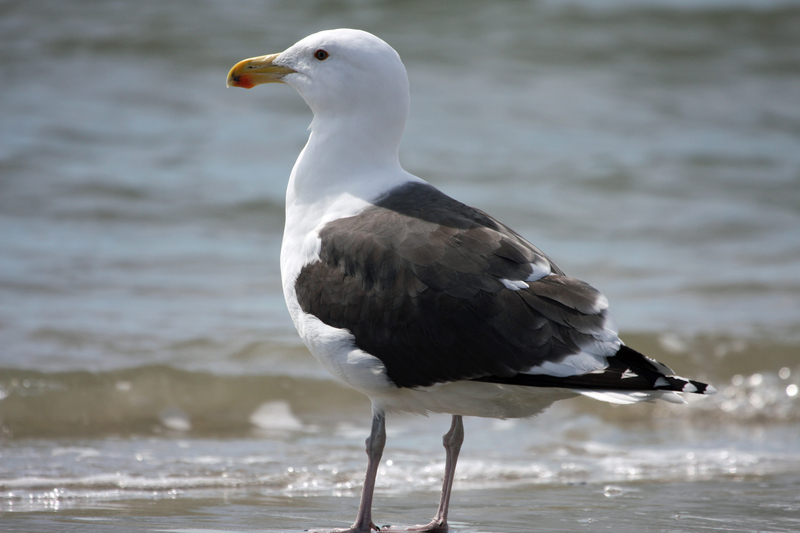 Most of the year –less so in late spring to midsummer- as you walk the beach or gener­ally look up into the air, it is hard not to come upon our featured subject this month, the Great black-backed Gull (Laurus marinus). What you may not be aware of is that this creature is notable as being the largest gull in the world with a wingspan of up to five feet. In the field it is identified by its black mantle, white head and undersides, a thick yellow bill with a red spot on the lower mandible and light pinkish legs. Both sexes look alike. In adult plumage, you can easily dis­tinguish these birds from the more common Ring-billed and Herring Gulls, both of which have much lighter col­ored silver backs. Immature birds are equally large with a generally overall brown color, light colored head and again, a very thick bill. A similar ap­pearing but far less common visitor to Ocracoke especially in the fall is the Lesser Black-backed gull. This species is slightly smaller, and its man­tle is more of a dark gray in­stead of being charcoal black and is most easily identified by its yellow legs. In my en­thusiastic beginning birding days, I was once at Chin­coteague and seeing a Great Black-backed Gull standing at a long distance away I was sure that it was a Bald Eagle. Only with a pair of binoculars did it dawn on me that it was a gull. Unlike the Laughing Gulls that chase the ferries, they are not particularly vo­cal, but when the do call; they make a harsh croaking “haw, haw, haw” sound. Nearly extirpated in the late 1800s due to use of its feathers in the fashion indus­try, The Great Black-backed Gull has made an unusual comeback. Prior to the 20th Century, in North America its primary nesting areas were the coasts and islands of the Canadian Maritime provinces. Unlike the 20th Century trend of many land birds whose nesting ranges have been moving north, as the population of this species started to rebound, its nest­ing range began to expand south first to Maine (1928) and eventually onwards as far as coastal North Caro­lina (1972). Historically, Great Black-backed Gulls were also generally nonmigratory. Thus when in the evening of Febru­ary 27, 1934 six of these birds were seen near Ocracoke, it was of such significance that it was reported in the vener­able ornithological journal, The Auk. There are probably far more Great Black-backed Gulls today than there were over the past couple of centu­ries. This increase in numbers and expansion in distribution range is not necessarily good news, especially for other gull species and terns as they may voraciously prey upon their fledglings. So why did this range expansion occur? Good question and some­thing worthy of study. Unlike other gulls that may hang around areas such as parking lots next to beaches waiting for a handout, Great Black-backeds generally are wary and avoid being near people. Bird note: An immature Wood Stork has spent the late winter on Ocracoke. Normally seen further south, this is quite an extraordinary sighting. Carol Pahl took nice some photos that can be seen online at Philip Howard’s Ocracoke Island Journal en­try for March 10, 2011 http://villagecraftsmen.blogspot. com/ .